MBARI Geologist Charles Paull was recently awarded the Francis P. Shepard award for “Excellence in Marine Geology” by the Society for Sedimentary Geology (SEPM). Since 1967, this award has been given to many notable marine geologists. But Paull may be particularly well-suited for this award because his interests align so closely with those of the award’s namesake, Francis Shepard. 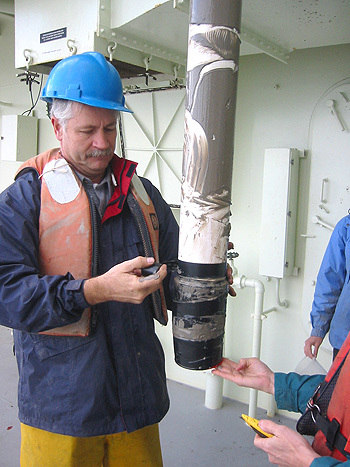 Since joining MBARI in 1999, Paull has spent much of his time studying the movement of sediment in submarine canyons, including Monterey Canyon, which originates just offshore of MBARI’s campus in Moss Landing. 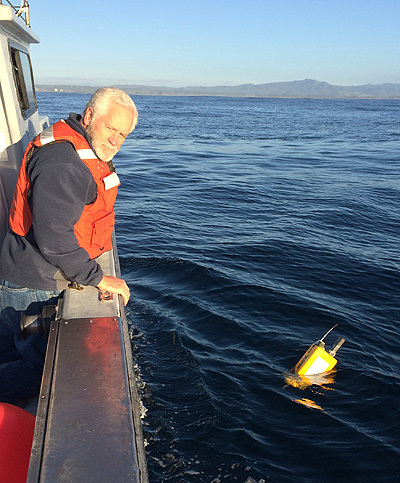 He has also mapped and explored methane seeps, faults, and a variety of other seafloor features using MBARI’s state-of-the-art underwater robots. Francis Shepard, sometimes known as the “father of marine geology,” was also fascinated by the shape of the seafloor and how it relates to past and present geological processes. During his 50-year research career, Shepard studied a diverse array of marine phenomena, from beach processes to salt domes. But he was particularly interested in seafloor mapping and submarine canyons. Like Paull, Shepard studied submarine canyons not only along the California coast but in many other locations around the world. For his early canyon studies, Shepard used lead-line soundings to determine depths and dredges to collect sediment samples. As technology advanced, he switched to using sonar, box coring devices, and SCUBA divers. His preference, however, was always for first-hand observation. In his autobiography, Shepard describes in detail one of his most memorable experiences–exploring Scripps Canyon using Jacques Cousteau’s innovative diving saucer (a small, two-person submarine). Although Shepard died in 1985, he would no doubt be thrilled to see the array of technologies that Paull uses to study the deep seafloor. He would certainly share Paull’s enthusiasm for using autonomous underwater vehicles (AUVs) to map the seafloor and remotely operated vehicles (ROVs) to explore its depths. He would probably also be fascinated by MBARI’s creative engineering work in developing instruments such as benthic event detectors, which can monitor turbidity flows in submarine canyons without being destroyed. Like Paull, Shepard was an observational scientist, who insisted that scientific observations should trump scientific dogma. Shepard also liked to challenge existing geological paradigms, including contemporary ideas about the formation of submarine canyons. But he was willing the change his mind when presented with well-documented field observations. Both Paull and Shepard have spent thousands of hours poring over bathymetric maps, trying to interpret the geomorphology of the seafloor and untangle the combined effects of sedimentation, bottom currents, fault movement, underwater landslides, and other seafloor processes. In 1941, Shepard surveyed the geology of the Gulf of California, discovering a series of steep underwater cliffs and faults, and speculated that they might be a southern extension of the San Andreas Fault system. Decades later, in 2012 and 2015, Paull and his research team conducted detailed surveys of these same features, which we now know form a transition zone between the San Andreas and the East Pacific Rise. In these and many other ways, Paull has followed in Francis Shepard’s wake, and forged his own paths as well. As such, he is a perfect candidate for the SEPM medal that bears Shepard’s name.